​Dr. JIJI VIJAYAN M.Sc, MBA, LLM, Ph.D A spiritual scientist,counsellor, trainer, researcher and legal and management consultant, Dr. Jiji has Masters Degree in Psychology, Law (LLM), and Business Administration (MBA). She has done her PhD in Management and Relationship Counselling. 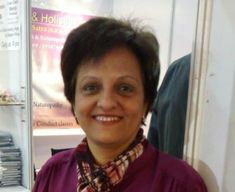 She was trained by the world famous spiritual scientists and mind gurus on topics like personal healing, soul level coaching, intuitive connection etc. For Dr. Jiji Vijayan, counselling and training do not limit to intellectual or physical spheres but it is the upliftment of an individual to whole new and unexplored realms. She facilitates people to change their outdated beliefs and negative programming in their lives. She believes in assisting people to discover and use the complete potentials within them, to enlarge their own creative space and to boost their confidence. That makes her counselling and classes different from the issue-based cosmetic surgeries. When you do the peripheral damage control, their effect won’t last long, but when an internal transformation is made. The effects last for a life time or even more, bringing changes in all areas on each spokes in the wheel of life. Being a lawyer for more than two decades, Dr. Jiji has dealt with a variety of legal matters including family conflicts, property matters, contracts, inheritance matters etc..
​In spite of enjoying best quality life, I had several questions which were unanswered. No book could give me those answers. Redikall empowered me to find my own answers. Today the restless seeker soul in me is at peace. I can meditate better and create designs with enhanced focus on creative ideas. And at the end of the day, I still have energy and zest to guide others to resolve their life issues with Redikall Healing. ​Omnipresence Academy of Life Pvt. Ltd. (OAOL) gratefully presents one of the strongest pillars of our foundation, Ms. Varsha Punwani, our Legal Advisor, Student Relationship Officer and an active Trainer, teaching on behalf of OAOL. Varsha Punwani, in spite of her brilliant educational background in Commerce, Law and as Company Secretary, and her rewarding career in the corporate sector for 33 Years; chose the journey inwards for her personal growth. Meeting Mother Teresa was a turning point in her life, where she decided to contribute to many more in society. Helping others to live out of their best potential, gives her immense fulfilment. She has studied Clinical Hypnotherapy and Regression Therapy, Pranic Healing, Reiki, Gestalt and a lot of self - help / self empowerment techniques to help herself and others. In order to fulfill her vision of positively influencing mass consciousness, she has decided now to focus on conducting trainings and workshops. She has effectively represented Omnipresence Academy of Life and has been trained to facilitate workshops on Redikall Healing, Soul’s Temple Technique, Mood Managers and many more training programs. Her strong positive intent coupled with the drive to inspire people to bring out their 100% potential, creates a magical effect in the lives of all the participants of her workshops. Beyond Techniques, it is the sheer passion and focus which has enabled her with a unique strength to inspire people to be their best. We wish her many more years of a rewarding and fulfilling career as a workshop facilitator and a trainer. ​Dr. Yogesh Vasandi is a well known Physician in Mumbai, India. He is associated with a Medical College and Hospital along with a flourishing private practice in Mumbai for over 25 years. He has been nominated for a National Award twice for the Category "National Status Award for Health Leadership" as under "Individual Achievement and Intellectual development" for outstanding contribution to the nation in the chosen field of activities recommended by the Research Committee and Advisory Board, Ministry of Health, New Delhi. He has been awarded & felicitated for Women empowerment by 50 Young Foundation annual awards in 2015, Mumbai. Cooper Hospital, CMPH Medical College & Hospital, Mumbai, Goa Homoeopathic Medical College; Technikon Natal, Durban, South Africa; Department of Psychology, Periyar University, Salem, Tamil Nadu; All India Institute of Local Self Government, Mumbai; SNDT University: Post Graduate Psychology section, Mumbai; Ahmedabad Homoeopathic Medical Association, Gujarat; Pune Chapter of Study Circle, Pune; Thadomal Shahani Engineering College, Mumbai; Bangalore Entrepreneur Group, Karnataka; M.L. Dahanukar College, Mumbai; Bevcon Wayers, Hyderabad; Ultratech Cement, Mumbai; Indo-American Society, Mumbai; APL Concept School, Turaipakkam, Chennai; Various NGO’s, Schools, Colleges, private groups, Lions Clubs, Rotary Clubs & Leadership training groups all over India & Dubai. He has been invited by the Department of Home Affairs of the Republic of South Africa to set up Educational Model for Medical Studies in Homoeopathy in Durban. Apart from being a very successful Homoeopath, he is also a Certified Past Life Regressionist. He has been senior faculty at the International Academy of Life and California Hypnosis Institute of India & Omnipresence Academy of Life. He has conducted the Teacher’s Training Program & Core Competency Program for the institute. The main focus of his work is to empower self and enjoy the journey on earth saying yes to life and flow with it.